Please use the drop-down menu to find more information about the SSHS Vocal Department. 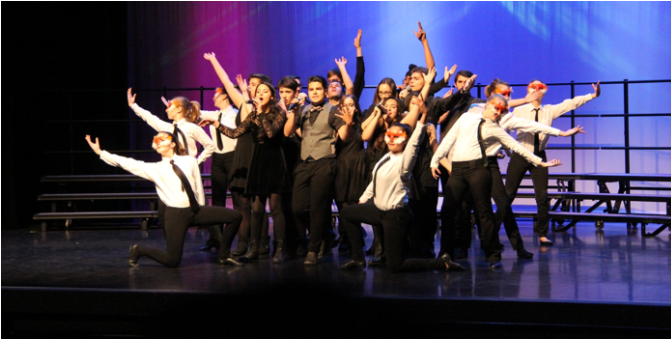 The Academy of Vocal Music at Santa Susana High School is a nationally recognized program of excellence. Our choirs have performed on TV on CNN, ABC, CBS, CNBC, FOX, performed for Heads of State, Presidents, Prime Ministers, Governors, and other noted dignitaries. Performances have also occurred in Germany, Hawaii, Florida, Washington, and New York. Santa Susana High School’s Vocal Music pathway, in the School of Visual and Performing Arts, is a performance-focused series of courses involving the understanding of and appreciation for all genres of music, alongside studies of the music industry and the professional careers found within it. Students will take part in their choice of five choirs, some traditional and some contemporary-focused, in order to build their abilities in music theory, vocal technique, and in some cases, choreography. Santa Su’s audition only choirs Abbe Road A Cappella, Advanced Women’s Choir, Vocal Ensemble, Women’s Choir, as well as the musical-theatre based Show Choir, have all earned superior ratings at numerous local festivals, as well as incredible performance opportunities such as Nancy Reagan’s Funeral, the Disneyland Candlelight Processional and the International Championship for High School A Cappella for Abbe Road in 2018. Students have the opportunity to travel both nationally and internationally, providing them with opportunities to perform in amazing locations and learn about different regions and cultures. High community involvement also gives the SSHS Vocal Music the ability to perform at the Reagan Library at least once per year, as well as access to solo-vocal events in Simi Valley. Working with expert accompanists, vocal coaches, choreographers, and costumers, the experiences students gain are at a professional level. With opportunities throughout the year to collaborate with theatre, film and stagecraft students, as well as professionals in the industry, vocal music students will gain an understanding of all of the options within the music profession. Most importantly, students get to take part in three vocal music concerts per year, each with its own theme, allowing choir students to develop their performance skills in front of a live audience. Students from the Santa Susana Vocal Music Program have gone on to attend colleges such as Berklee School of Music, Westminster Choir College, NYU TISH, Pace University, Harvey Mudd, AMDA, UCLA, USC, Bard University, and many more. Alumni are working in the music industry as singers, musicians, studio singers, talent agents, music therapists, sound design, choreographers, and more, all the way to Broadway. Certificates are offered to students who complete the coursework for an academy emphasis in Vocal Music. Students who complete the certification program will leave with a portfolio of works performed in ensemble and solo performances and a comprehensive understanding of different genres within vocal music. The program currently is comprised of six different types of vocal music classes. Information on Certification can be found on our Certification Page. Step inside our website for class descriptions, our calendar of events, helpful musical resources and a whole lot of fun! !